We have been having so much fun this week, sharing our Valentine’s Day ideas! A yummy dessert, a Valentine Mantel, cute Valentine envelopes and today Amy shared a Valentine mug with a cute chalkboard heart on it. For many years, I have been putting together Love Buckets for our boys. It’s one of those family traditions that you can never be too old for. I’ve shared our Love Buckets the last couple years, in fact exactly one year ago today I shared the small plastic Love Buckets that I put together. But this year, I decided to get a little more crafty with these metal buckets. Draw your shape on the back of the labels – we used a cookie cutter to make a paper template. Cut it out. You can of course use anything you like to fill the bucket. I typically buy things for the boys that they “love”, like their favorite candy, books, magazines, toys etc. etc. 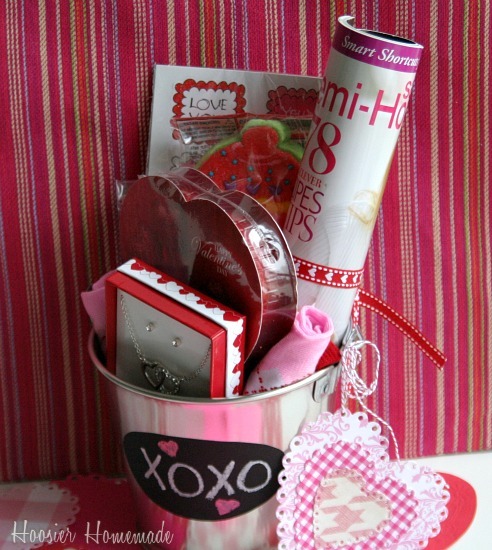 This Love Bucket is filled with gifts for a girlfriend; some fun Valentine stickers, a magazine, Valentine socks, candy and a pretty necklace. I bought everything at Walmart and spent about $13, but you could certainly spend less. 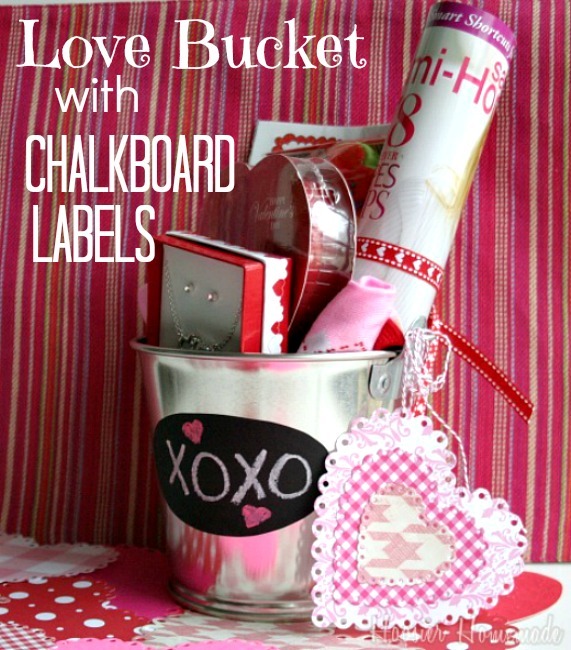 The other great thing about the buckets is that you can use this idea to create endless organizing and craft projects. I’m seeing a fun project in the future for our office. Tomorrow it’s YOUR turn to share! Link up your Valentine recipes, crafts, decorating, pretty much any love filled idea you have to the Valentine Party and it will show up on ALL four blogs at the same time! Pretty cool huh? 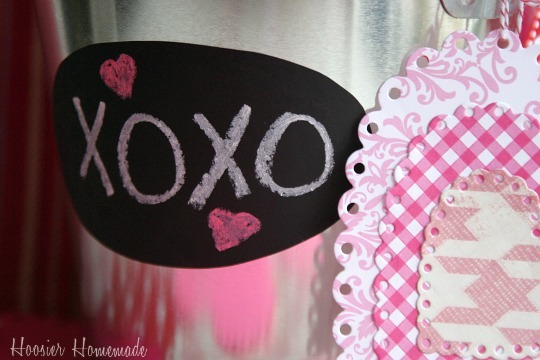 AND you won’t want to miss the FREE Valentine Printable from The Paper Cupcake! You are going to FLIP out over it!! I also created a Pinterest Board for Valentine’s Week, and will be pinning your awesome ideas! So follow along and gather some ideas! Love your bucket! Great idea! these are darling! I love the chalkboard label:) So fun! I would you to come link up to my Friday Frolic party! Stop by if you get the chance! I love your love buckets. They are fantastic; I now I would like to receive a valentine like that. Thanks for the great idea. Oh my, the idea of a love bucket is awesome! Great project!! Great project! Love it! 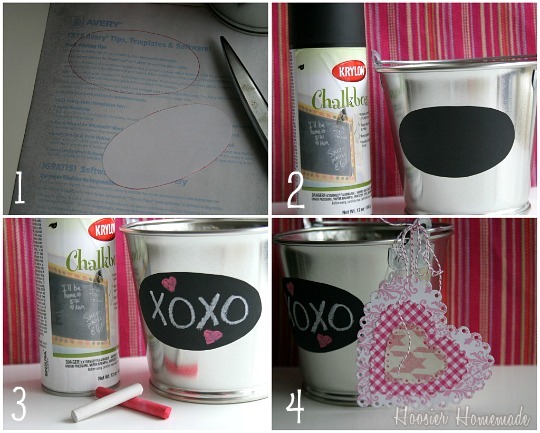 I hope you will link this up to I Heart Projects Linky Party. 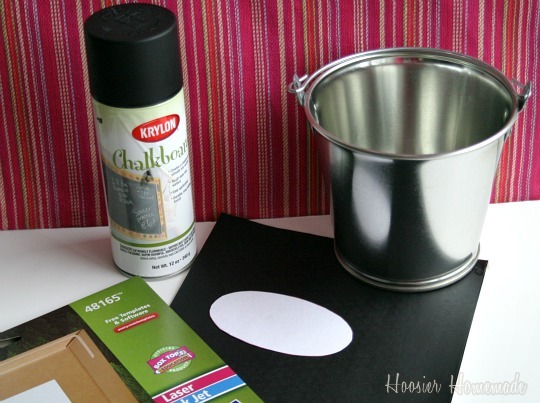 Love your bucket with the chalkboard label — I really must do something with my chalkboard paint soon! Love that idea Dana! Thanks for stopping by!